I did something new and different today, I volunteered at a Marathon, the ING Georgia Marathon. I have not yet run my first marathon, but was hoping this would be my first. Because of the fall, and broken collar bone mid year last year, my training was put on hold and so I wasn't ready. I figured, what better way to still be part of a marathon, and see a bit of what it is like than to volunteer to help. I helped at one of the water stops. I was at the water stop at mile 18, during one of the many hills. I woke up at 4:45 and was out the door by 5:10. I had anticipated it would take me 45 minutes to drive to where I needed to be, but it wasn't near as far as I thought. I arrived about 5:45 and was the first one there. After about 10 minutes the one in charge of the stop arrived and we started to unload the truck. We had till 8:30 when the elites would come by. The elites arrived on schedule, I still cannot believe how fast they were moving. We had everything set up like shown in the first pic above, but we were told that the elites would not be stopping by our stop, because they had special water at the next stop. Not sure what the "special water" was, but they still grabbed some water as they flew by, knocking a lot of water off as they tried to grab some. We were not holding anything out because we were told they wouldn't be stopping. 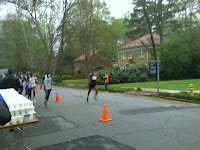 It was a little while before we really saw any of the non-elite runners. It is still absolutely amazing how fast these next were running, they were still running well under 3 hour marathons. They are still considered elite in my book. The next 3+ hours I was standing with one arm out holding Gatorade. It was a lot of fun watching the runners go by and seeing how many different types of runners were running, all of them very inspiring and making me wish I was ready to run my marathon. We even had one single amputee come by. She was hurting, but it was very inspiring to see her running this marathon. We all have nothing to complain about. It was a cold morning, and our hands were freezing, but the time still flew by. It was a lot of fun, and I would do it again, however, next time I hope to be running it. Tim-great use of your time. Your situation reminds me of the guy in "Spirit of The Marathon" who volunteered when he got injured training for Boston. I'm sure the runners appreciated you donating your time in the cold. It may not seem like when the runners fly by, but I assure you they really appreciate the work the volunteers do. I was amazed when someone had brought fresh oranges out for runners yesterday. It was just what I needed nearing the last few miles of the race. Hope you are ready for your first marathon soon, but you can never be too prepared for 26.2! Hi Tim. Well done with the volunteering. 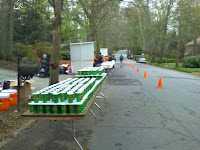 Have to say I would be lost during a marathon without the water, jellies and words of encouragement from the volunteers. Remember that when you do your first marathon. Use the support from the crowd to get you through the last few miles. Are you close to doing one? Have you a marathon in mind. P.S. I enjoy your twitter updates. very cool of you to volunteer; I just ran my 8th a little over a week ago (the National Marathon in Wash DC), and I swore I would volunteer for a fall marathon near me. It must be just as great a feeling to ENcourage as it is to BE encouraged. What's your new goal marathon? Hope your injury heals soon! I think the elite runners have their own water assigned to them in a different area than the "masses..." lol. I cannot imagine running 26.2 miles at a speed I could not maintain for even a mile. That is great to volunteer. I think it can be so much fun. Cheering people on you don't know can be so contagious!! And volunteers and their cheers are so appreciated by the runners. Thank you all for stopping by and the comments. I know how much I appreciate the volunteers in shorter races, the longer ones I am sure are just that much more. I totally agree with the other commentators: What would you ever do without volounters? Volunteering at a race is something I haven't had the opportunity to do yet, but hope to very soon. Good for you! That's fantastic. Those elites run a whole marathon at a faster pace than I can run a mile I reckon! Jesse - you should do it, I waited too long to do it, but it was worth my time.